Whaaaaaat? 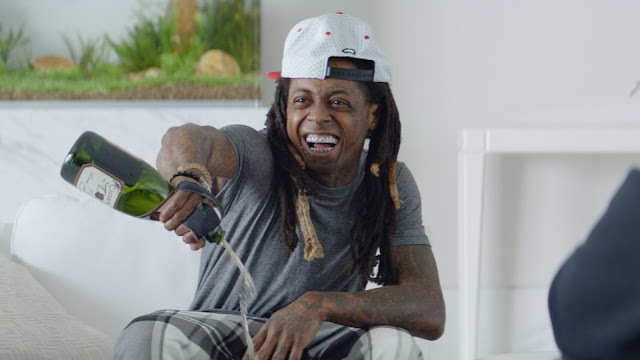 Lil Wayne’s Galaxy S7 still works, even after he pours champagne on it. Samsung's marketing for its newest phones, the Galaxy S7 and S7 Edge, is in full swing, and the latest spots feature Lil Wayne and Wesley Snipes. In one of the Wieden & Kennedy created spots Wesley Snipes just happens to be in Wayne's living room as he's delivering a baby elephant. The only time it’s ok to ignore Wesley Snipes is when you’re Lil Wayne delivering a baby elephant with the Galaxy S7 and Gear VR. Lil Wayne in a canoe with Wesley Snipes.